CareSource Headquarters, based in Dayton, Ohio provides healthcare services to multi-generations, from infants to seniors. Reaching out to the community, The Art Company challenged local artists to propose projects depicting people in various stages of their lives. Twenty artists were selected. With one-on-one involvement to create the final pieces, interesting original artwork in diverse mediums are now on display. 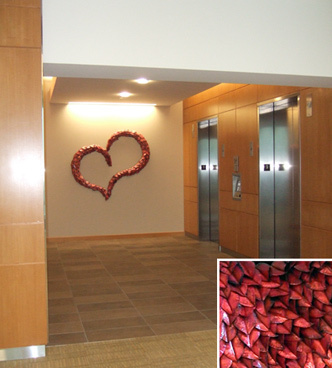 Cincinnati-based Colliers International asked The Art Company to solve two decorating challenges, to provide color and excitement to an upscale 40-foot long corporate office hallway and brighten their cafe. 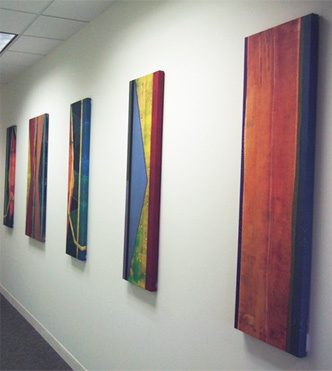 A gallery-wrapped series of giclées on canvases now creates a flow of continuous color in the hallway. For the cafe, using the design of their custom-made chairs for inspiration, The Art Company commissioned art made with wood to create a unique and integrated solution. Ivy Tech, in Lawrenceburg, Indiana, turned to The Art Company to select artwork to enhance their image and energize the students. 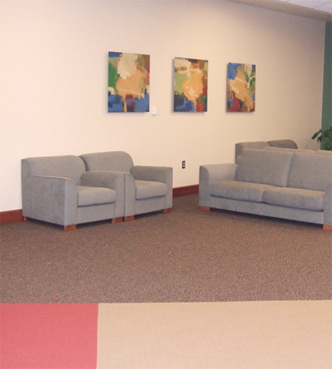 The result was a selection of eclectic contemporary art that complements the vibrant colors found throughout the facility and makes a statement about Ivy Tech’s vision for the future. 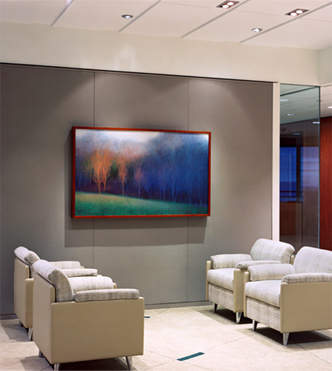 The Art Company helped create the balance between contemporary and traditional in this Cincinnati-based Law Firm. A 3-person committee approved the selection of works from local artists to assure they would create an ambiance that would be pleasing to their diverse client base.